Please take a minute or two and complete the Computer Club Yearly Survey by April 15th. The information from this survey helps us determine any changes needed to improve services. We are much more than computers, we are about communications & technology, using smartphones, tablets and social media. We teach how to USE this technology with applications to stay connected, entertain and learn. You can also explore your heritage; view the universe or something closer to home, like your new computer; iPad; tablet; digital TV or smartphone. Members are encouraged to share their knowledge and experiences on relevant topics. We welcome all members to get involved in the club whether with administration or technology; teaching; monitoring or as a class assistant; not to mention parties, yes, we do all this while having FUN! 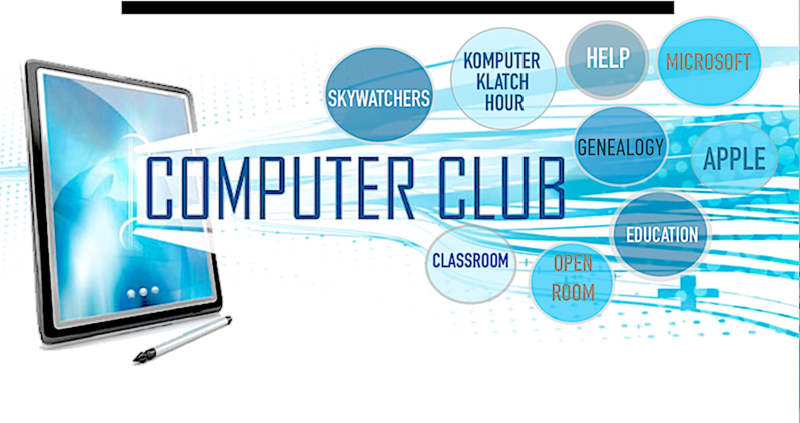 Come learn with us…during monthly Club meetings with interesting topics designed to keep members informed; SIG meetings specializing in more in-depth areas and weekly Komputer Klatch (KK) sessions with a wide range of topics current to the technology. We also offer a variety of classes, most hands-on, taught by experienced members and offered in a small classroom setting. We will meet the First Wednesday of each Month at 7:00 PM at Hidden Cypress through April 2019. The topic will be sent to members on our mailing list. Come see us, if you are having a problem or a question about your tablet, smartphone or computer. We offer help several times a week. Check our web page for dates & times. There is probably at least one session for you. Select the Help drop-down menu at the top of the page.